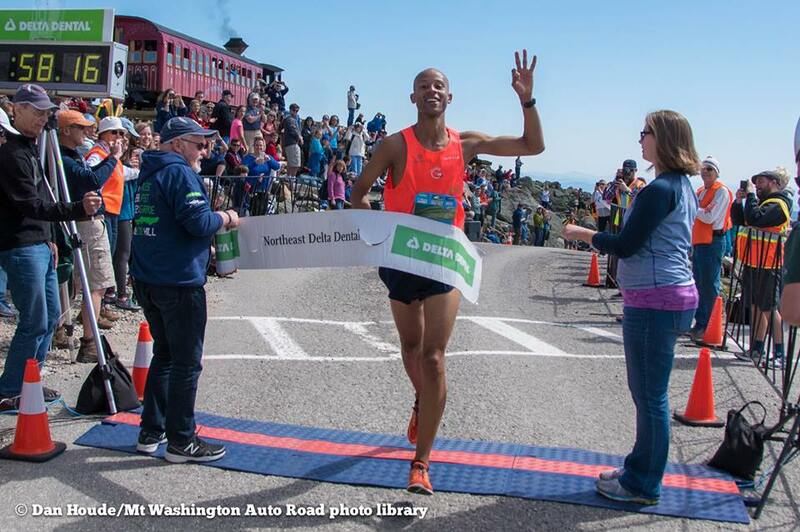 PINKHAM NOTCH, N.H. – The winners of this weekends 56th Annual Mount Washington Road Race are no strangers to the winners circle. Joe Gray of Colorado Springs, Colorado and Kim Dobson of Eagle, Colorado continued their winning streaks Saturday. Gray took the lead about a quarter mile in to the race and never gave it up finishing in 58:17. That was just 2 second slower than his record from last year, which is the fastest an American runner has ever run on the Auto Road course. Dobson finished the race in 1:09:34 which put her in 10th place overall in the race. Dobson’s 4th win in four attempts ties her with Anna Pichrtova who accomplished the feat in her first four attempts as well. Dobson was within 8 seconds of her personal best of 1:09:25 that she ran in 2012. The top New Hampshire finisher is awarded the Crossan Cup each year in memory of Gary Crossan who won the race four times. This year’s winners were Jim Johnson of East Madison, NH and Amber Ferreira of Concord, NH. Johnson finished fifth overall while Ferreira was the 5th woman. Both had phenomenal races on the mountain today. Johnson in particular wasn’t sure of how his performance would go but was very happy with the results. In other milestone news, 96 year old George Etzweiler finished his ninth Mount Washington race in a time of 3:23:15. Etzweiler noted during the awards that he has started incorporating some strength training into his training regime and looks forward to returning next year.